Highland’s Noah Dado gets inside for a lay-up against the Centennial defense on Tuesday. Highland battled back from a double-digit deficit in the fourth quarter of their Tuesday night home boys’ basketball game against Centennial, but couldn’t put their opponents away in regulation before falling 63-58 in double overtime. Scot coach Chris Powell was proud of his players’ efforts, but noted that a few miscues played a big role in determining the difference between victory and defeat. While the game was close throughout the first three quarters, Centennial was able to pull away very gradually. 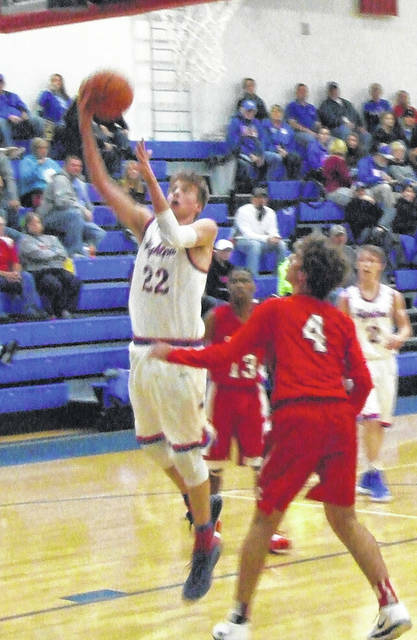 While the Scots got a pair of three-pointers by Andrew Wheeler in the first quarter, the Stars held a 12-8 lead after eight minutes of action. Two baskets by Travonne Jackson helped boost that advantage to an 18-11 margin in the first two minutes of the second quarter, but Highland responded with back-to-back baskets by Ian Taylor and Noah Dado to keep the score close. A put-back by Chase Carpenter got the team within a 24-22 score with 2:15 left in the half; however, the Stars held a 9-4 scoring advantage over those final minutes to lead by seven going into the intermission. Trailing 39-30 midway through the third, Highland made another run, getting a three-pointer by Carpenter and a two-point shot by Wheeler to get back within four. Unfortunately for the Scots, much like in the second quarter, they’d give up some quick points to their opponents to undo that work. Holding a 40-36 lead, the Stars scored seven straight points to open up a 47-36 advantage and they’d still be in front 49-40 at the start of the fourth quarter. A basket by Amin Mullins and a free throw from Jackson made it 52-40 with 6:46 left in regulation. Thanks to some hot shooting by Highland, though, that lead would vanish before the three-minute mark had been reached. Carpenter started the run with a free throw. Branton Howard and Taylor followed with back-to-back threes. Dado connected from two points and Taylor added a second three-pointer and with 3:04 left on the clock, Highland had battled back from 12 points down to tie the score. Neither team could score over those final minutes, though. Highland had a golden opportunity with 90 seconds left, but missed a pair of free throws. They were able to rebound the second miss, but could not convert offensively. Centennial then held the ball for the final shot, but were unable to get the ball up, sending the game to overtime. Carpenter struck for the Scots in the extra period, hitting from the field with 2:49 left. That would be their only offense of those four minutes, though. Syquee Womack hit one-of-two free throws to make it a 54-53 game 16 seconds later. Late in the period, Highland had the ball, but turned it over with 28 seconds left. Centennial then drew a foul and Jaylen Gilbert was good on the second of two foul shot attempts to send the game to a second overtime. Ty Stiffler matched a pair of Star baskets with his own shots to keep the game tied at 58 with two minutes remaining. However, after a missed pair of free throws from Jackson, Centennial got the rebound and fed Gilbert for a huge three-pointer. Highland was unable to score over those final two minutes and the Stars hit a pair of free throws in six tries to finish on top by five. Carpenter led Highland with 16, while Wheeler scored 12, Dado had 11 and Taylor finished with eight. Powell said after the game he was most upset about how hard his team fought, only to still wind up on the short end of the score.